INTRODUCTION: E-cigarettes have emerged as the most commonly used tobacco or nicotine products among youth in the United States (US), and usage with other products (dual use) is not well understood. This study assessed dual use and identified associated factors of usage in school-going youth in the high tobacco burdened region of rural Appalachian Tennessee. METHODS: Two waves of data for the same cohort of students were collected in 2014 (Wave 1) and 2016 (Wave 2). Dual use of e-cigarettes with any other tobacco product was the dependent variable. The independent variables consisted of exposure to tobacco use at home, home smoking rules, smoking inside the vehicle, attitudes toward smoking, exposure to tobacco industry marketing/promotion, and peer/family pressure. Descriptive statistics and multivariate logistic regression analyses were conducted to determine the prevalence of dual use and delineate factors associated with usage. RESULTS: Dual use increased from 13.3% in Wave 1 to 18.6% in Wave 2. Results of logistic regression show that exposure to tobacco industry marketing/promotion was significantly associated with dual use in the two waves, odds ratio (OR) = 4.18 (confidence interval [CI] = 1.69–10.38) and OR = 4.43 (CI = 2.03–9.67), respectively. While allowing smoking inside the vehicles, sometimes, significantly increased dual use in Wave 1 (OR = 3.18 [CI = 1.19–8.48]), exposure to tobacco use at home (OR = 2.94 [1.24–6.97]), and peer/family pressure (OR = 2.92 [1.87–7.19]) increased usage in Wave 2. CONCLUSION: The increasing trend in dual use of e-cigarettes and other tobacco products among youth in Appalachia Tennessee suggests a critical need for comprehensive tobacco control programs to avert exacerbating disparities in tobacco use and tobacco-related diseases in the US. OBJECTIVE: The objective of this retrospective study was to assess the efficacy of medical thoracoscopy in diagnosing of tuberculous pleurisy and characterize tuberculous pleurisy with medical thoracoscopy. METHODS: A total of 575 patients with tuberculous pleurisy who underwent medical thoracoscopy were included in the study. Demographic data, clinical manifestations, and routine and biochemical tests on pleural fluid, cultures of pleural fluid, sputum, and pleural biopsy for the detection of Mycobacterium tuberculosis and pathological findings were evaluated. RESULTS: Sputum, pleural fluid, and pleural biopsy cultures were positive for M. tuberculosis in 12.5%, 19.2%, and 41.9% of patients, respectively. 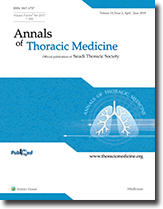 Furthermore, there were significant differences in total positive tuberculosis (TB) tests in the pleural cavity according to patient's age (<18 years old, 50.0%; 18–34 years old, 50.2%; 35–59 years old, 34.8%; >60 years old, 18.6%; and all groups vs. >60 years old, P < 0.001). Patients with 18–34 years old were more likely to have granuloma in pleural biopsy specimens when compared to patients >60 years old (77.0% vs. 37.9%). The percentage of patients with high adenosine deaminase (ADA) levels in pleural fluid (>40 U/L), who were <18, 18–34, 35–59, and > 60 years old, was 83.3% (15/18), 72.8% (193/265), 51.2% (88/172), and 34.7% (17/49), respectively (all groups vs. >60 years old, P < 0.001). CONCLUSION: Medical thoracoscopy is effective for diagnosing tuberculous pleurisy. Younger patients with tuberculous pleurisy have a higher number of positive TB tests in the pleural cavity, are more likely to have granuloma in pleural biopsy specimens, and have higher ADA levels in the pleural fluid. BACKGROUND: Chronic obstructive pulmonary disease (COPD) patients are at an increased risk of postoperative pulmonary complications (PPCs). The purpose of this study is to evaluate the risks and benefits associated with preoperative steroids in COPD patients. METHODS: The National Surgical Quality Improved Program database was used to identify 92 COPD patients who underwent surgery at the American University of Beirut Medical Center between 2009 and 2013. COPD was diagnosed based on postbronchodilator forced expiratory volume in 1 s to forced vital capacity ratio <0.7 and a history of smoking. The exposure of interest was preoperative systemic corticosteroid therapy. The primary outcomes were PPCs and wound complications. Cardiac and urinary complications along with unplanned readmission or reoperation and death were also evaluated. RESULTS: Overall 42.4% of patients received preoperative systemic corticosteroids. Postoperative wound complications were significantly more frequent in COPD patients who received preoperative systemic corticosteroids compared to patients who did not (10.3% vs. none, respectively, P = 0.03). However, PPCs were not significantly different between patients who received preoperative systemic corticosteroids and patients who did not (17.9% vs. 13.2%, respectively, P = 0.53). There were no significant differences in the secondary outcomes. CONCLUSIONS: This study suggests that preoperative administration of systemic corticosteroids in stable COPD patients is associated with an increased risk of postoperative wound complications but may not reduce PPCs. CONTEXT: Asthma control is suboptimal in the Middle East and North Africa (MENA). AIMS: The aim of this study is to assess the level of asthma control in Saudi patients as per the Global Initiative for Asthma 2012 classification and explore its potential predictive factors. SETTINGS AND DESIGN: Epidemiological Study on the Management of Asthma in Asthmatic Middle East Adult Population (ESMAA) is a multicentric, descriptive, epidemiological study assessing asthma management in the MENA region. In this article, we report the results of patients from Saudi Arabia included in the ESMAA study. METHODS: Adult patients diagnosed with asthma at least 1 year before study entry were considered for inclusion. Asthma control level and its predictive factors were explored. Treatment adherence and quality of life (QoL) were assessed by MMAS-4© and Short Form 8 Health Survey QoL questionnaires, respectively. STATISTICAL ANALYSIS USED: Descriptive statistics were done considering two-sided 95% confidence intervals. Logistic regression was used to explore the potential predictive factors of asthma control. All statistical tests were two-sided, and P < 0.05 was considered statistically significant. RESULTS: Data of 1009 patients from Saudi Arabia were analyzed. Less than one-third of patients (30.1%) were found to have controlled asthma with significantly higher QoL. High level of asthma control was reported among male patients and those with high educational level, while age, body mass index, and adherence to treatment were found to have no effect on asthma control. CONCLUSIONS: Asthma control remains suboptimal among Saudi population. This needs huge efforts to achieve acceptable levels of control and better QoL for asthma patients. Further studies are still needed in Saudi Arabia and the Middle East region. BACKGROUND: Reports of thunderstorm asthma in the Middle East are few. This study is the first to report on cases of near-fatal and fatal thunderstorm asthma in Kuwait on December 1, 2016. METHODS: We conducted a chart review and interview with adult patients admitted to Mubarak Al-Kabir Hospital with near-fatal asthma, defined as an exacerbation requiring intubation and mechanical ventilation or hypercapnia with a PaCO2≥6 kPa. Information, including patient age, gender, occupation, asthma history, medication usage, and clinical outcome, was collected. For fatal asthma cases, patients' data were collected from the Forensic Department at the Kuwait Ministry of Interior. RESULTS: A total of 17 patients were admitted with near-fatal asthma. Fifteen patients (93.8%) had a prior history of asthma, with an average duration of 9 years. Five patients (33.3%) reported receiving a corticosteroid inhaler from their physician. Fifteen patients (93.8%) reported relying on a short-acting β2-agonist alone to manage their asthma. 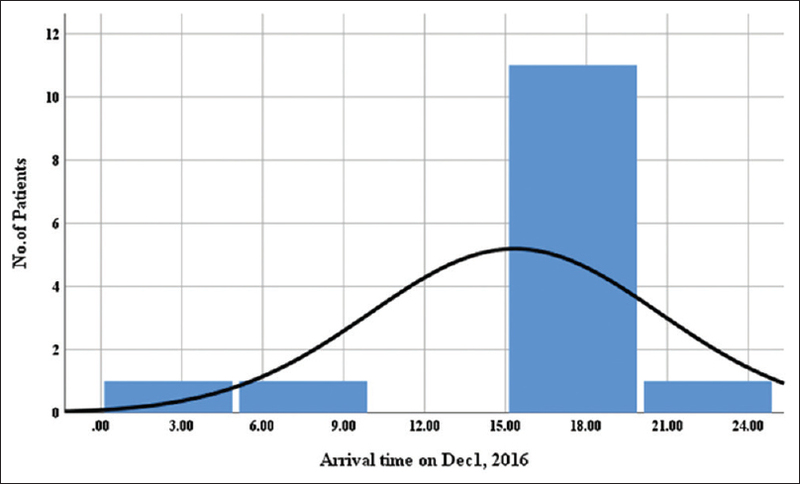 Eleven patients (68.8%) reported being outdoors during the storm. Eleven patients were diagnosed with fatal asthma. CONCLUSION: The study is the first to report on a thunderstorm-associated asthma epidemic in Kuwait and emphasizes the potential dangers associated with this entity. Diffuse idiopathic pulmonary neuroendocrine cell hyperplasia (DIPNEC) is an abnormal proliferation of pulmonary neuroendocrine cells that occur without underlying etiology. Here, we report a unique case of 55-year-old female with unusual presentation of DIPNECH and thymoma and on the background history of Crohn's disease that might point toward an autoimmune phenomenon. To the best of our knowledge, there were no previous reports of DIPNECH with either thymoma or Crohn's disease. DIPNECH has premalignant potential and reported in association with carcinoid and non-small cell lung cancer; however, its autoimmune association never reported. 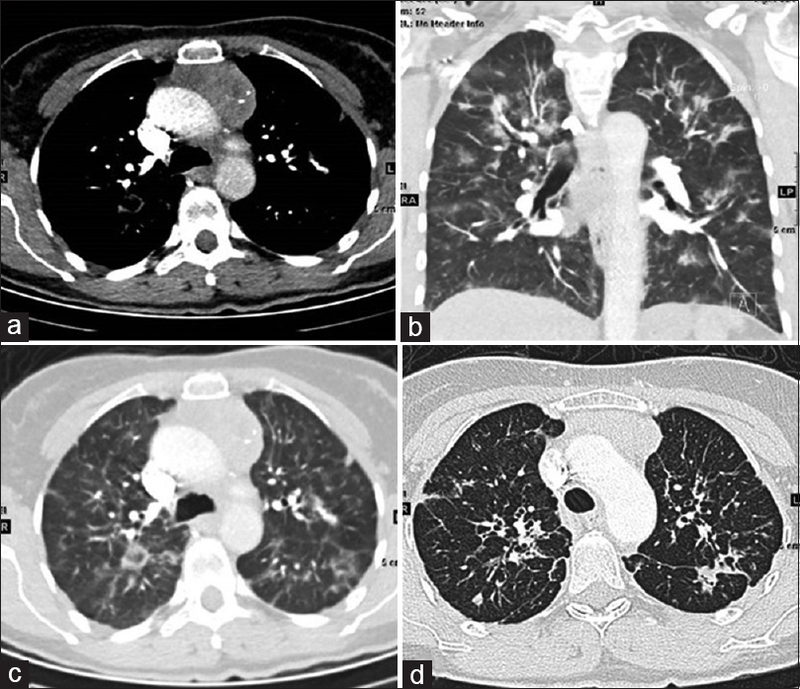 The presence of multiple lung nodules along with evidence of small airway disease should alert the physician to include DIPNECH as part of the differential diagnosis given its malignant potential. The prognosis is variable and depends on the presence or absence of underlying malignancy as well as the severity of airflow obstruction.